Maybe this is art not craft but where to draw the line? What amazing talent all who we have selected display. And what an amazing body of work. Without denim jeans we wouldn’t have such creativity but the work from these artists rises far above the mere garment. 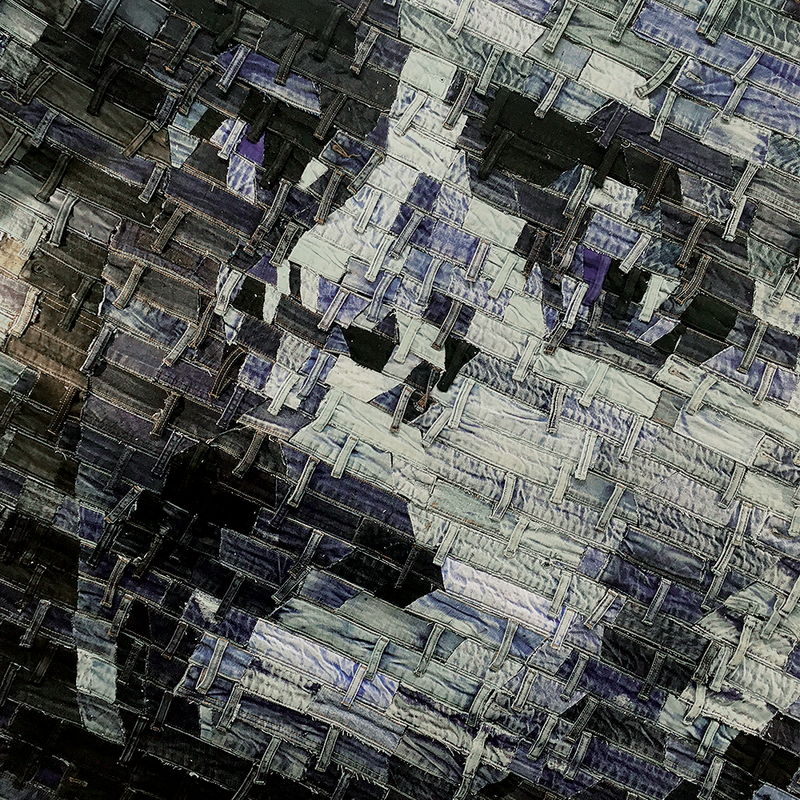 Again we want to share the amazing work of JIM ARENDT. This time through his denim sculpture. Is it Craft? Is it Art? It is an energetically abstract use of denim art by American Artist TERI GANDY-RICHARDSON. IAN BERRY recently exhibited his skills at the smallest gallery in London - in Soho. Featuring original album covers realised in denim from Soho Records. AMAZING! DENIZ is a Turkish artist who works in many mediums. For this project “denim skin” she chose to use recycled denim jeans and jackets. This week we feature Deniz exclusively for reasons which are obvious in their extraordinary dextrous creativity. IAN BERRY is a British artist living in London. 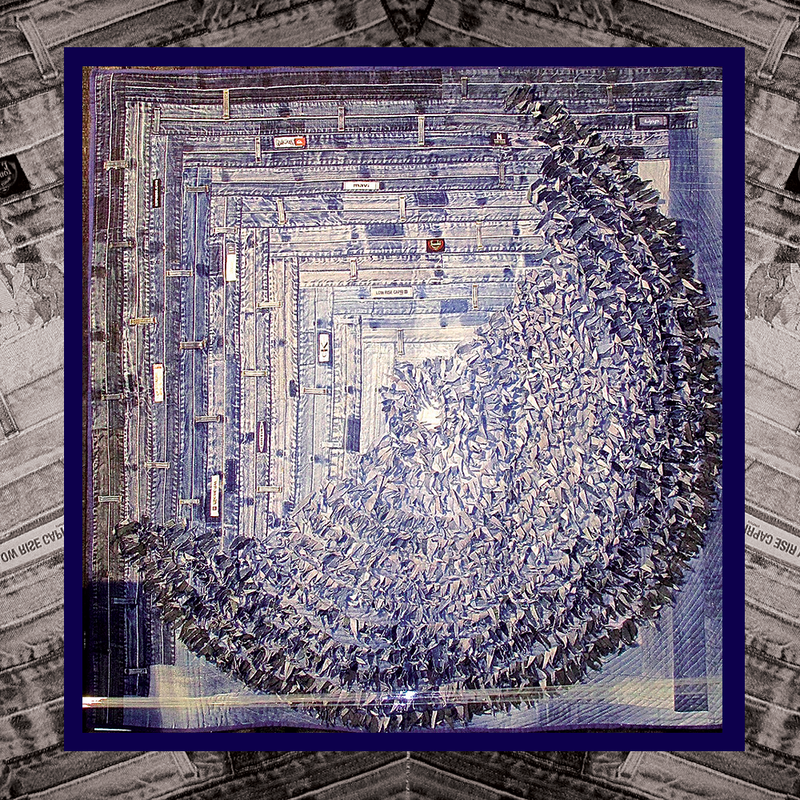 He creates work solely from indigo denim re-using old jeans and jackets and fashioning them into urban landscapes and other unique works of art. Anna Weber denim artist. Talking Heads below appear almost animated. 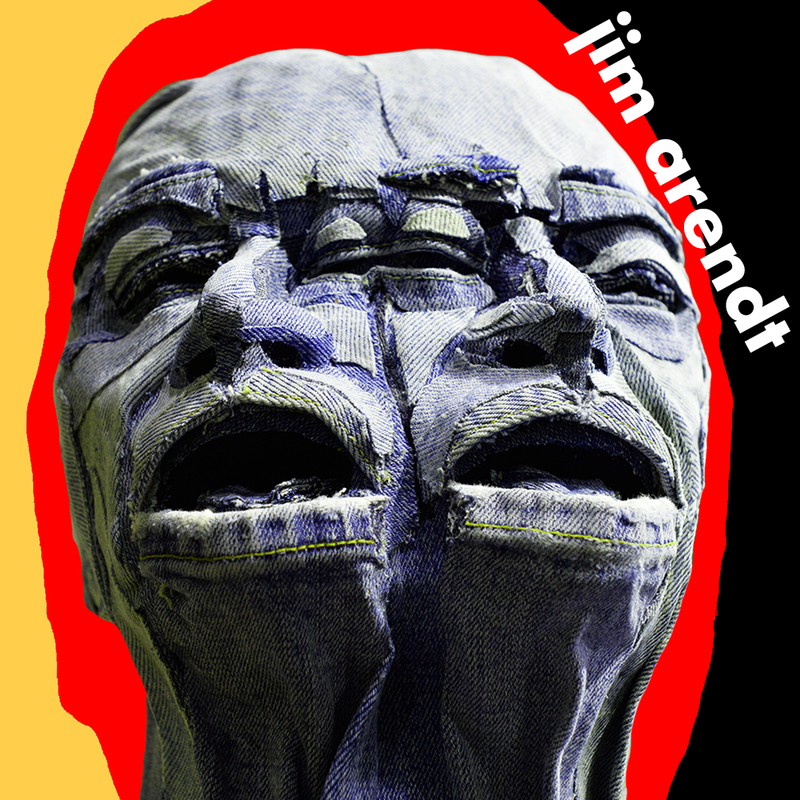 Jim Arendt an American artist specialising creating the “the everyday” from denim . Realising his images in both flatted collaged denim as well as 3D and sculpture pieces. Another beauty from Ian Berry. Light Circle Art is painting onto denim, available on Etsy. 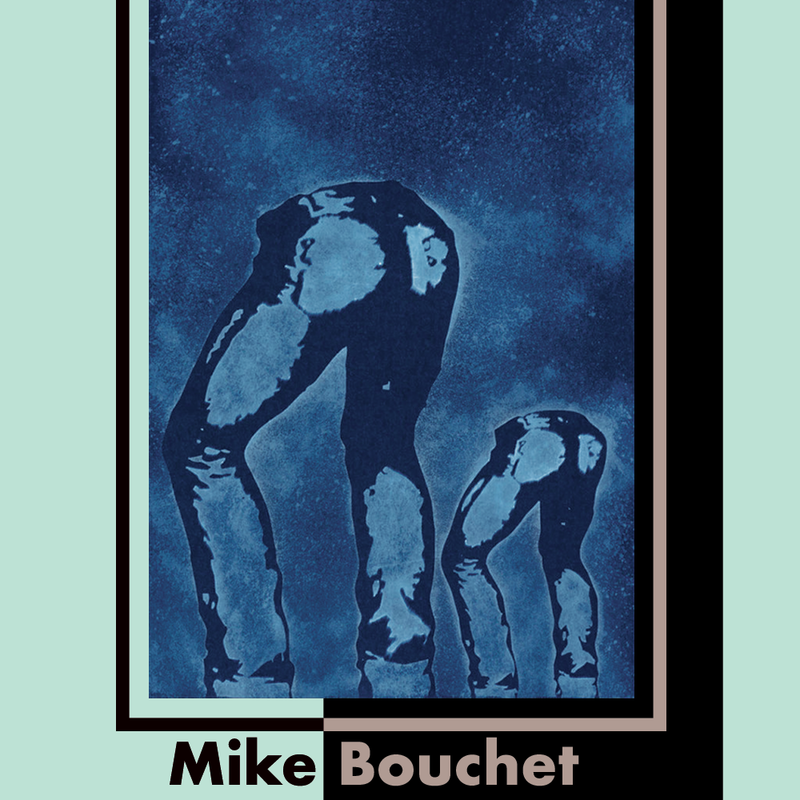 Mike Bouchet’s exhibition “ denim-rear-view-mirror” at the Marlborough Contemporary Gallery 2017. Another portrait from PAM GLEW. 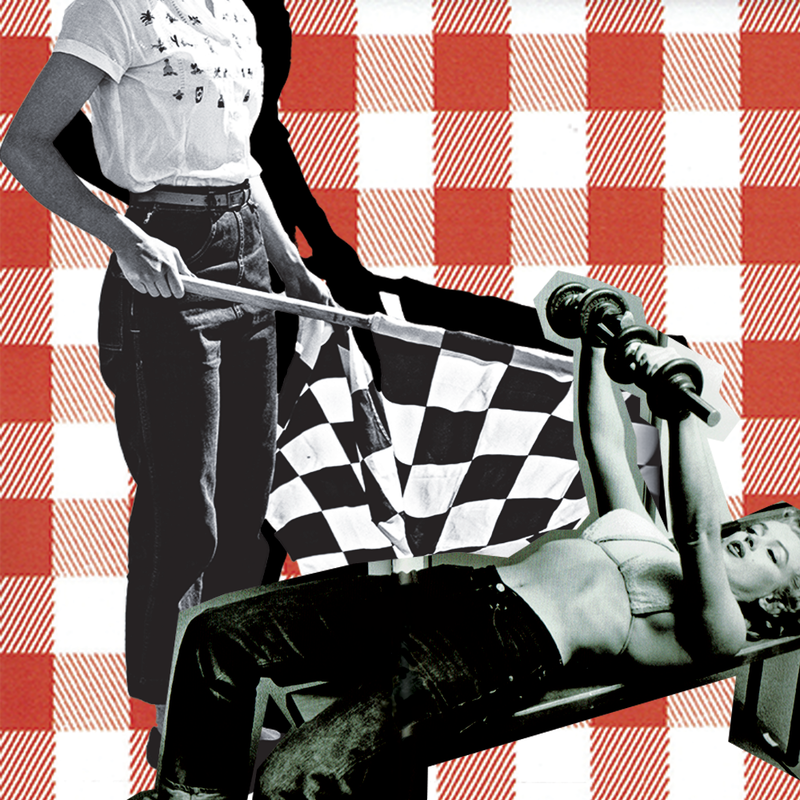 Denim has been an iconic fabric for generations. It is a fabric like no other with quixotic properties of losing its indigo colour after washing, bleaching and sunlight exposure. As well as harnessing the desire of both the mass jeans market as well as of those aficionados of the blue stuff denim has captured the imagination of creative artists Worldwide. 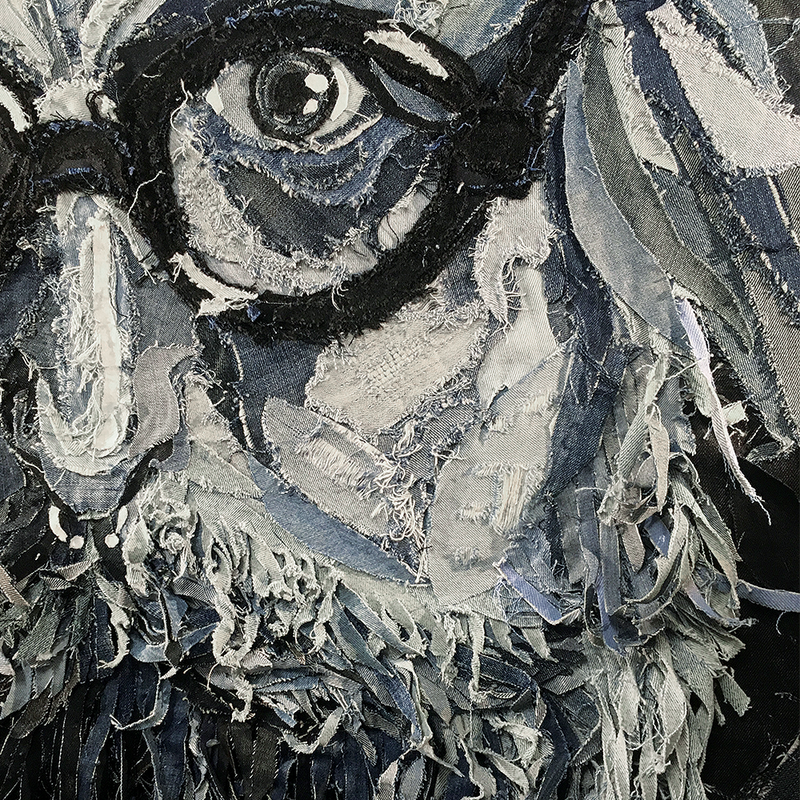 From the use of pre-loved indigo denim as a craft form it is now used as a high art form by unbelievable talented creatives using denim as paint. 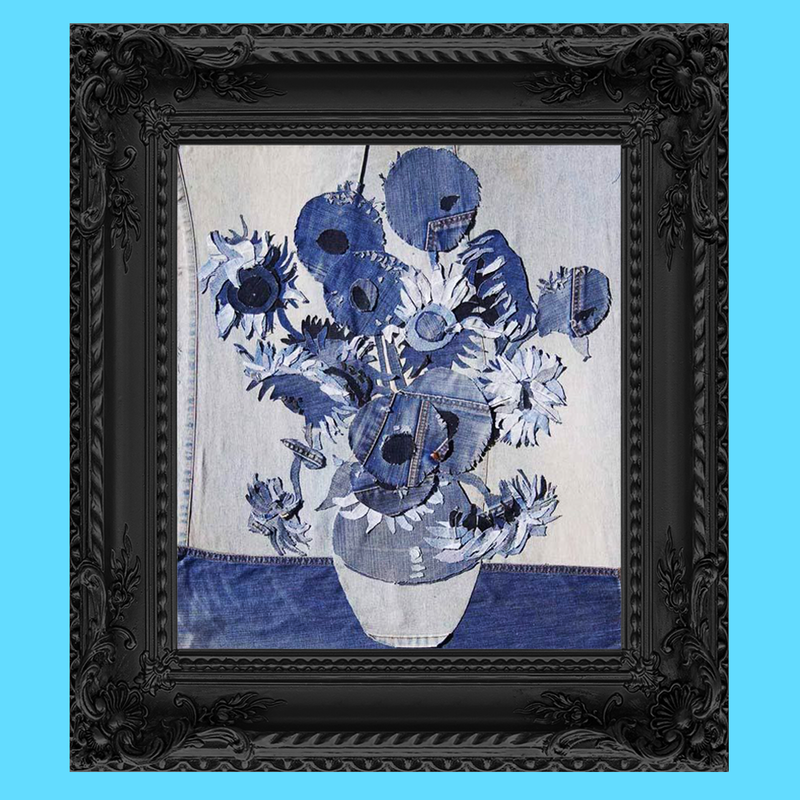 Its unique ability to bleach down, wear down/out and display different casts of blue enables such artists to take the use of denim to a much higher level than mere jeans. 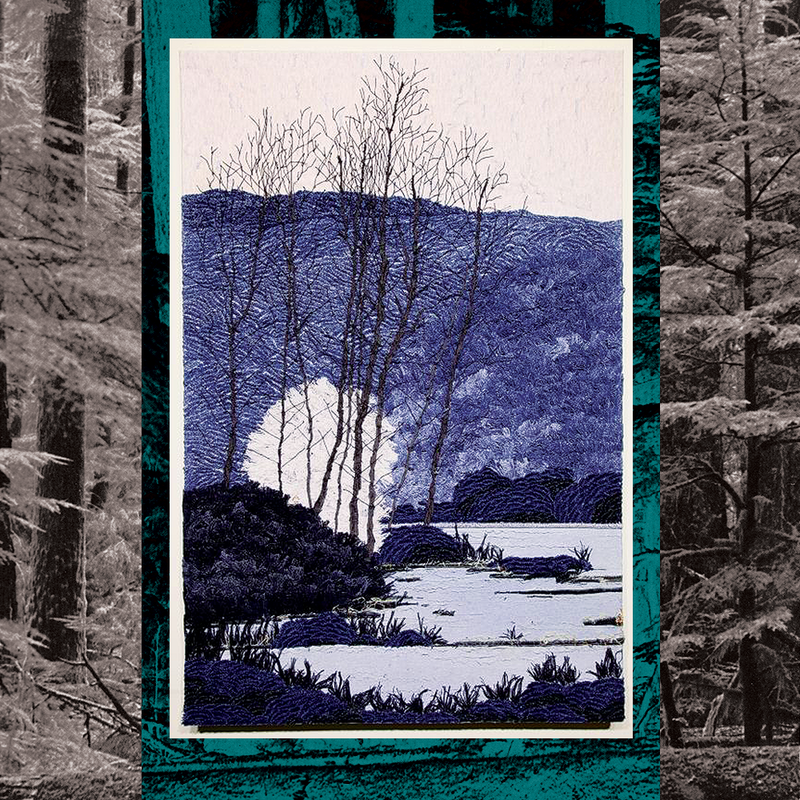 Jim Hodges needs no introduction from a mere denim mortal such as myself. "Jim Hodges: Give More Than You Take" is co-organized by the DMA and the Walker Art Center and co-curated by Jeffrey Grove, the DMA's Hoffman Family Senior Curator of Contemporary Art, and the Walker's Executive Director Olga Viso. 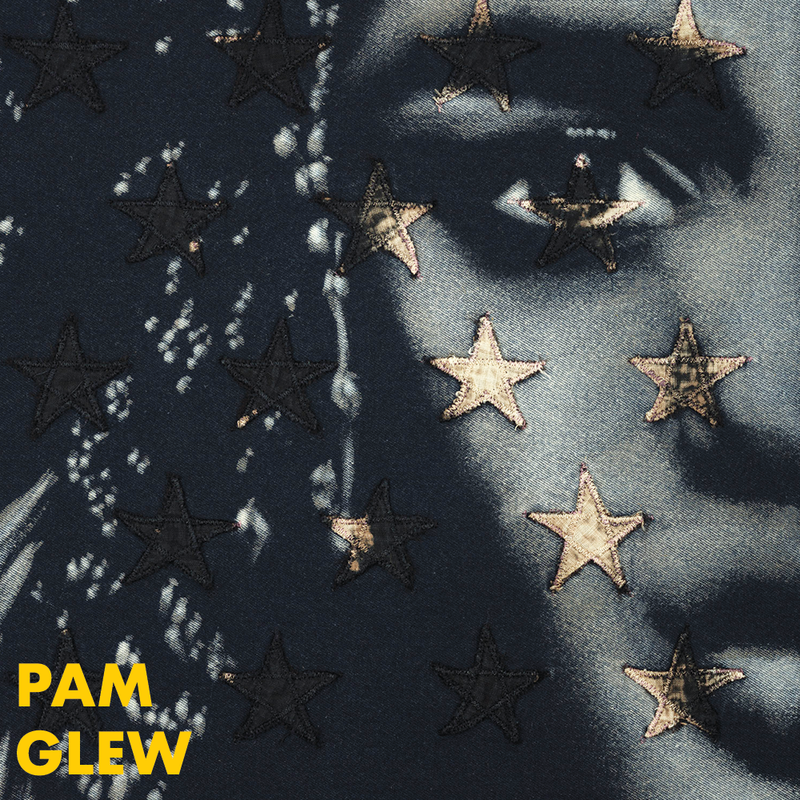 PAM GLEW. Is a contemporary British artist who is best known for her distinctive bleaching techniques and use of recycled denims. Portraiture is a speciality where her use of bleach and recycled denims bring another life to her faces. Skimpy fitted denim jackets were the handwriting of Wrangler hitherto so well known for their jackets and fitted denim shirts. Man style cuffed jeans are totally pulled together when surrounded by 50’s style . Essential blazers , velvet, tweed, cord always with the ubiquitous white shirt and rolled denim cuffs. The blazer could replace the cardigan for a smart retro attitude. Waist focus - high cut, belted 50’s style purple casted denims. Slanted side pockets and rolled cuffs land girl style combines with wide short sleeved shirts. The white shirt as the Mom jeans accessory once made hugely famous by MM. Super high waisted Mom jeans in dark textured indigo denim. To complete the 1950’s inspired ensemble add skimpy short sleeves with ditsy print or embroidered motifs. Matelot stripes with wide retro neckline works perfectly with straight cut or Mom jeans. Don’t forget the rolled cuffs. Bare midriffs, front tie shirts and high buttoned cardi’s work with high waisted easy cut well worn indigo denims. Crackle textured denim is essential for these Mom jeans. Now with stretch to help their fit. 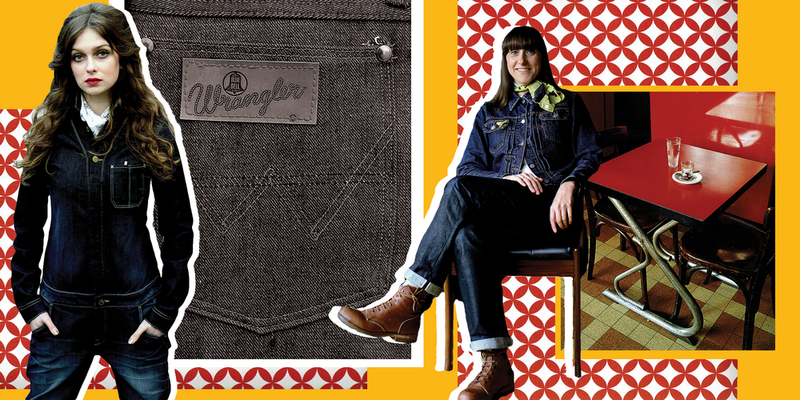 Denim designer and developer Jill Lawrence founded The Denim Eye to share her knowledge and passion for the blue stuff with a wider audience of like-minded denim lovers. Jill is still an active denim designer, crossing continents with her denim visions and working with some of the world's best-known brands and makers. The Denim Eye brings an in-depth look at trends and techniques in denim and jeanswear as seen by a creative insider. Each month there will be a real time trend with twice weekly update posts and insights, where we will share insider knowledge of interest. You will be able to buy vintage and archive pieces in our Finds shop, where everything is one of a kind evergreen vintage and occasionally we will offer bespoke new pieces. Sign up to receive our monthly newsletter with denim insights from our creative insider! Content © The Denim Eye 2016 unless otherwise specified.